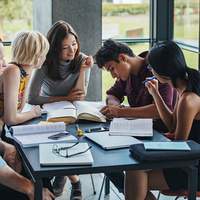 No matter where you are in your study process, join our SAT specialist for practice and advice on all parts of the test, including math, English, and essay writing, and to learn strategies for time management, stress management, and high-percentage guessing. Anyone preparing for the SAT or ACT is welcome, and resources for both tests are available. Practice booklets will be provided courtesy of College Board, but you are also encouraged to bring your own test books or browse the library’s collection.